Whenever there is a forest fire, it always pains my heart to think of all those precious natural resources perishing in the flames. It is really painful to watch those trees that would have existed for thousands of years burn to ashes within no time taking along with them the lives of numerous animals and insects. I am just wondering how many people really realize how much each forest fire costs the nation as a whole. I feel that each tree that is burned down, each animal that is killed and each insect that perishes in the fire is a loss to the nation as it can affect the balance of its biodiversity. The fires that raged through the pine forests in different locations around Thimphu yesterday and today definitely call for stricter and harsher penalties for those involved in starting the fire, be it deliberately or accidentally. I know many countries have tougher laws on the protection of natural environment but in Bhutan, it seems our laws are not harsh enough to discourage people from making unnecessary fires in the forests, or throwing the cigarette butts into the bushes without putting off the fire. It’s sad to believe that yesterday’s fire that destroyed the forests above Sangaygang could have been started by a couple who were seen smoking in the area. Many people believe that the fire could have started from a popular dating spot at Sangaygang where couples mostly hang around, smoking cigarettes and making fires to keep themselves warm. If those who were dating up there at the time were responsible for starting the fire yesterday, they must be seriously punished to teach them a lesson and the public must be informed to discourage others to commit similar mistakes in the future. I strongly feel that the destruction of natural resources either through fires or illegal felling of trees must be treated as a serious crime and must be dealt with tougher laws. Unlike in the past, we were lucky this time. The newly launched helicopter service could come to our rescue on time and we could save thousands of acres of our forests. 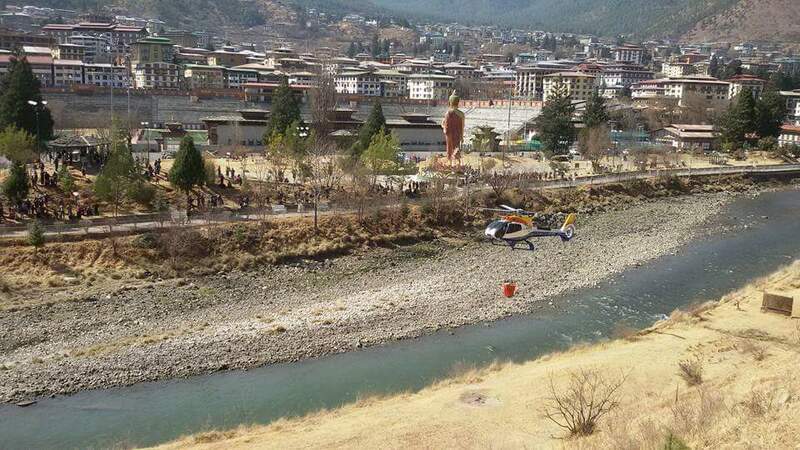 Within hours, officials and volunteers could successfully contain the fires with additional aid from the helicopter that carried water from Wangchu River and helped douse the fire from the air. When the fire was finally brought under control by late afternoon, we all thought that the ordeal for the fire-fighting team was over, but again at around the same time today, the fire reappeared on the other side of Thimphu. When I heard the siren of the fire-engine and the roar of the helicopter for the second time, I began to doubt if the cause of the fire was really accidental. I even questioned myself if some crazy people are behind these mischievous acts because I believe ‘once’ is a mistake; ‘twice’ is a choice. 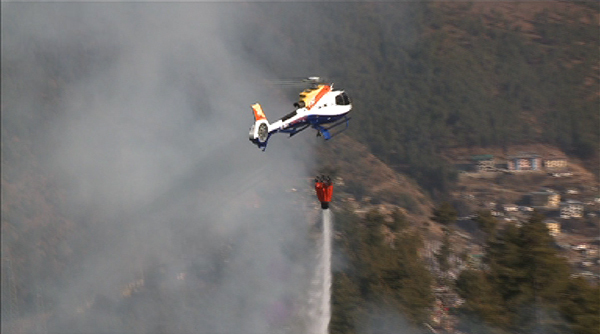 Whatever may be the cause, the helicopter proved to be very useful in fighting fires this time. Due to unfriendly topography, it’s mostly difficult for ground fire-fighters to battle the flames but with the helicopter service in place, our people didn’t have to struggle for days and weeks this time as before. Now what lessons can we take from these latest incidents? Winter is a dry season and with pine forests covering a huge portion of our northern and western regions of our country, we must all be always vigilant and careful with fires. Any unattended fire or a carelessly dumped cigarette butts can spark huge fires and aided by the wind, it can spread out easily. So, we must always be mindful of what we do in the forests. Even when we try to burn the trashes in our home gardens, we must do it only when there is no wind and we must never leave it unattended until all the fires are put off. One small mistake can cost the nation a huge portion of its natural resources which we cannot afford to waste like that. So if anybody notices some signs of fire anywhere in the forest, he or she must immediately alert the Fire Department at 110 so that it can be contained before it gets out of control. More importantly, anybody who is involved in such mischievous acts must be punished for their crimes so that the public will be more careful next time. Protecting our forests and natural environment from such man-made disasters must be the collective responsibility of all of us. We cannot always rely on the expertise of our fire-fighting men and the helicopter service.